This chapter describes how to set constraints that can restrict an application feature based on user access privileges or device requirements. Section 14.1, "Introduction to Constraints"
Section 14.2, "Defining Constraints for Application Features"
A constraint describes when an application feature or application content should be used. Constraints can restrict access based on users and user roles, the characteristics of the device on which the mobile application is targeted to run, and the hardware available on the device. You can set constraints at two levels: at the application feature level, where you control the visibility of an application feature on a user's device, and at the content level, where you can specify which type of ADF Mobile content can be delivered for an application feature. The overview editor for the adfmf-feature.xml file enables you to set both of these types of constraints. Constraints are evaluated by the ADF Mobile runtime and must evaluate to true to enable the end user to view or use specific content, or even access the application feature itself. ADF Mobile runtime evaluate the constraint to true. If the runtime evaluates the constraint to false, then it prevents an end user from accessing the application feature, because it does not appear on the navigation bar or within the springboard. To accommodate such factors as device hardware properties or user privileges, a single application feature can have more than one type of content to deliver different versions of the user interface. By setting constraints on the content of an application feature, you designate the conditions for determining what end users can see or how application pages can be used. Using the Content tab, shown in Figure 14-2, you can, for example, specify content that delivers one type of user interface for users who have been granted administrative privileges and a separate user interface for those who have basic user privileges. In addition, content-level constraints can accommodate the layout considerations of a device. Figure 14-2 illustrates how the HR sample application performs this using a constraint based on the screen width of a device to deliver AMX Mobile task flows that call pages tailored to the layout of the iPhone and the iPad. 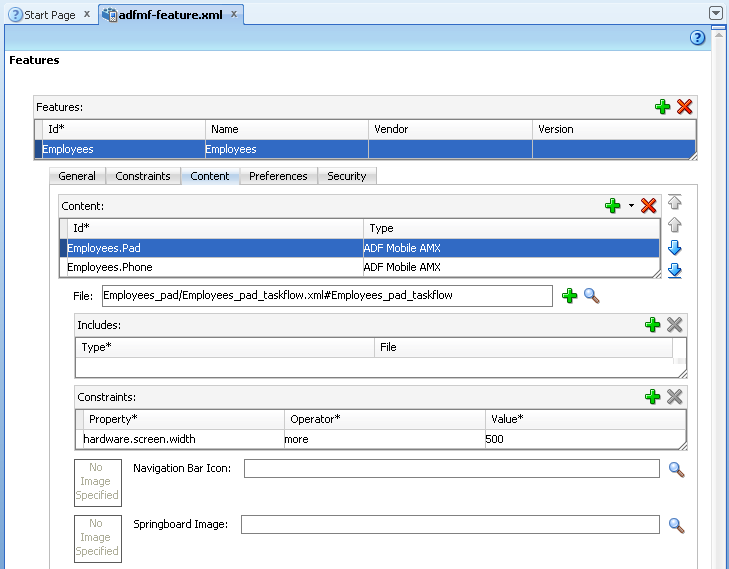 When an end user launches the HR sample application, the ADF Mobile runtime evaluates the constraint that is set for the Employees application feature. If the runtime ascertains that the device's screen width is greater than 500 pixels, it selects the Employees_pad_taskflow.xml file, which calls the ADF Mobile AMX pages designed for the iPad. If this constraint evaluates to false (that is, the screen width is less than 500 pixels), then the runtime selects the ADF Mobile taskflow that calls iPhone-specific pages, Employees_phone_taskflow.xml. In addition, the Content tab enables you to select navigation bar and springboard images that display when the runtime selects specific content. If you do not select content-specific images, then ADF Mobile instead uses the application feature-level images that are designated in the General tab. Images must adhere to the platform-specific guidelines, as described in Section 5.9.1, "How to Define the Basic Information for the Application Feature." When setting application feature-level constraints, the property, operator, and value attributes of the <adfmf:constraint> element (a child element of <adfmf:constraints>) enable you to restrict application usage based on a user, a device, or hardware. An example of defining these attributes, shown in Example 14-1, illustrates defining these attributes to restrict access to an application feature to a Field Rep and to also restrict the application to run only on an iOS-powered device. You declaratively configure the constraints for a selected application feature using the Constraints tab in the Features page, shown in Figure 14-2. Select a property and an appropriate operator and then enter a value. For more information on using properties, see Section 14.2.3, "About the property Attribute." Entering the values in the Constraints tab updates the descriptor file's <adfmf:constraints> element with defined <adfmf:constraint> elements, similar to Example 14-1. ADF Mobile provides a set of property attributes that reflect users, devices, and hardware properties. Using these properties in conjunction with the following operators and an appropriate value determines how an application feature can be used. The URL of the REST Web service that transmits a list of user roles and privileges. 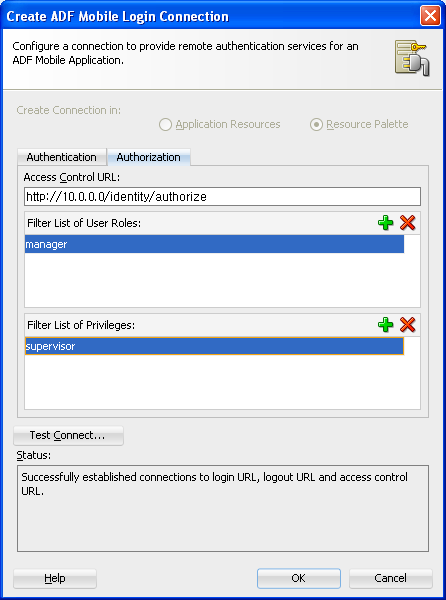 A list the user roles checked by the application feature. See also Section 18.4.7, "What You May Need to Know About the Access Control Service." You control access to application features using constraints based on user.roles and user.privileges. For example, to allow only a user with manager_role role to access an application feature, you must add a constraint of user.roles contains manager_role to the definition of the application feature. contains—If the collection of roles or privileges contains the named role or privilege, then the runtime evaluates the constraint to true. Example 14-2 shows an example of using the user.roles property with the contains operator. The application feature will appear in the mobile application if the user's roles include the role of employee. not—If the collection of roles or privileges does not contain the named role or privilege, then the runtime evaluates the constraint to true. In Example 14-3, the application feature is not included if the user's privileges contain the manager privilege. The hardware object references the hardware available on the device, such as the presence of a camera, the ability to provide compass heading information, or to store files. These properties use the equal operator. hardware.networkStatus—Indicates the state of the network at the startup of the application. This property can be modified with three attribute values: NotReachable, CarrierDataConnection, and WiFiConnection. Example 14-4 illustrates the latter value. As illustrated in this example, setting this value means that this mobile application feature only displays in the mobile application if the device hardware indicates that there is a Wi-Fi connection. In other words, if the device does not have a Wi-Fi connection when the ADF Mobile application loads, then this application feature will not display. This constraint is evaluated at startup on iOS-powered devices. If a device does not have a Wi-Fi connection at startup but subsequently attains one (for example, when a user enters a Wi-Fi hotspot), then the application feature remains unaffected and does not become available until the user stops and then restarts the mobile application. hardware.hasAccelerometer—Indicates whether or not the device has an accelerometer. This property is defined by a true or false value. Example 14-5 shows a true value, indicating that this application feature is only available if the hardware has an accelerometer. Because all iOS-based hardware have accelerometers, this property must always have a value of true for the application feature to be available on iOS-powered devices. hardware.hasCamera—Indicates whether or not the device has a camera. This constraint is defined using a value attribute of true or false. In Example 14-6, the value is set to true, indicating that the application feature is only available if the device includes a camera. Not all iOS-based hardware have cameras. This value is dynamically evaluated at the startup of ADF Mobile applications on an iOS-powered device. At this time, the mobile application removes the application features that do not evaluate to true. hardware.hasCompass—Indicates whether the device has a compass. You define this constraint with the attribute value of true or false, as shown in Example 14-7. Not every iOS-powered device has a compass. This value is dynamically evaluated at the startup of ADF Mobile applications on an iOS-powered device. At this time, the mobile application removes the application features that do not evaluate to true. hardware.hasContacts—Indicates whether the device has an address book or contacts. You define this constraint with the attribute value of true or false, as shown in Example 14-8. Because contacts on iOS-based hardware are accessed through Apache Cordova, the value attribute is always set to true for iOS-powered devices. hardware.hasFileAccess—Indicates whether the device provides file access. You define this constraint with the attribute value of true or false, as shown in Example 14-9. The application feature is only available if the runtime evaluates this constraint to true. Because file access on iOS-based hardware is accessed through Apache Cordova, the value attribute is always true for iOS-powered devices. hardware.hasGeoLocation—Indicates whether or not the device provides geolocation services. You define this constraint with the attribute value of true or false, as shown in Example 14-10. The application feature is only available if the device supports geolocation. Apache Cordova does not provide access to the gelocation service for all iOS-powered devices. Depending on the device, the application feature may not be available when the constraint is evaluated by the runtime. hardware.hasLocalStorage—Indicates whether the device provides local storage of files. You define this constraint with the value attribute of true or false, as shown in Example 14-11. The application feature only displays if the device supports storing files locally. Because Apache Cordova provides access to local file storage on all iOS hardware, the value attribute is always true for iOS-powered devices. hardware.hasMediaPlayer—Indicates whether or not the device has a media player. You define this constraint with the value attribute of true or false, as shown in Example 14-12. The application feature only displays if the device has a media player. For iOS-powered devices, the value attribute is always true, because Apache Cordova provides access to media players on iOS-based hardware. hardware.hasMediaRecorder—Indicates whether or not the device has a media recorder. You define this constraint with the value of true or false, as shown in Example 14-13. The application feature is only included if the device hardware supports a media recorder. Set this value to true for all iOS-powered devices because all iOS-based hardware have media recorders which can be accessed through Apache Cordova. Some devices, such as the Apple iTouch, do not have a microphone but can allow end users to make recordings by attaching an external microphone. hardware.hasTouchScreen—Indicates whether or not the hardware provides a touch screen. You define this constraint with the value attribute of true or false, as shown in Example 14-14. The application feature is only included if the device hardware supports a touch screen. Set the value attribute to true for iOS-powered devices, because all iOS-based hardware provides touch screens. hardware.screen.width—Indicates the width of the screen for the device in its current orientation. Enter a numerical value that reflects the screen's width in terms of logical device pixels (such as such as 320 in Example 14-15), not physical device pixels, which represent the actual pixels that appear on a device. The value depends on the orientation of the device. This value is evaluated at the startup of the mobile application when the runtime evaluates constraints and dismisses application features with constraints that do not evaluate to true. If a user rotates the device after the ADF Mobile application starts, ADF Mobile's runtime does not re-evaluate this constraint because the set of application features is fixed after the mobile application starts. hardware.screen.height—Indicates the height of screen for the device in its current position. Enter a numerical value that reflects the screen's height in terms of logical pixels, such as 320 or 480, as shown in Example 14-16. The value depends on the orientation of the device. When the mobile application starts, the ADF Mobile runtime evaluates the screen height value for this constraint as part of the process of dismissing application features with constraints that do not evaluate to true. If a user changes the orientation of the device after the ADF Mobile application starts, the runtime does not re-evaluate this constraint, because the set of application features is fixed after the mobile application starts. hardware.screen.availableWidth—Indicates the available width of the device's screen in its current orientation. Enter a numerical value that reflects the screen's width in terms of logical pixels, such as 320 or 480, as shown in Example 14-17. The value depends on the orientation of the device. hardware.screen.availableHeight—Indicates the available height of the screen for the device in its current position. Enter a numerical value that reflects the screen's width in terms of logical pixels, such as 320 or 480, as shown in Example 14-18. The value depends on the orientation of the device.